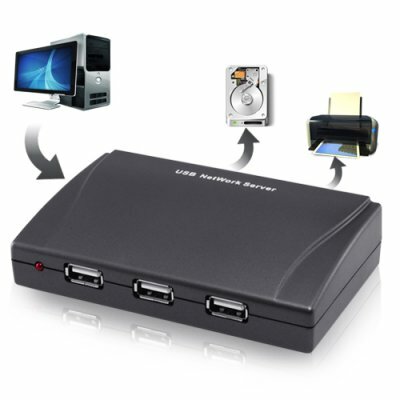 Successfully Added 4 Port USB Device Server to your Shopping Cart. Share all your USB devices with everyone else by using this new 4 Port USB Server. So what exactly is a USB Device Server? This Tech Gadget is a network switch that allows any user on the network to take control of a remote USB device without the need to disconnect and connect the USB device to their own computer. Modern USB devices are great, but it becomes so inconvenient when someone else on another computer wants to use your scanner, burner, external HDD, or other Cool Gadget. Having to physically remove the device for someone and then get it back from them later is a real pain. Well, here is the perfect solution - a 4 Port USB Device Server! By utilizing this USB Server, all you have to do is hook up your USB Devices and other Tech Gadgets to this 4 Port USB Device Server and then attach the USB Device Server to your network. In this way, everyone on the network can instantly gain access to the USB device as if it were locally attached to their computer. You may be thinking, this sounds like just what I need, but I am not good with computers, will I actually be able to install and use this device? No worries my friend - installation is super easy. Simply connect the USB Server onto your network using an Ethernet cable and then install the included software on your connected computers and you are ready to go! Now, as soon as any USB device is connected to the USB server, anyone on the network can immediately take control of the device and use it. The 4 Port USB Device Server is great for personal, office or corporate uses. Get one for yourself or a few for your company office. Available at Chinavasion's famous wholesale price, click on "Add to Cart" right now and we will express ship it tomorrow - Guaranteed. Simultaneous connection to one USB device by two or more user is NOT possible, you must "disconnect" any USB device before others can connect and use it. Can I use the USB Server with my external CD/DVD Rom or HDD? Yes, it is perfect for these kinds of devices. Can I connect the USB Server to a wireless router? Yes, you can connect the USB Server to a wireless router and effectively making your USB devices wireless. I have connected my USB display projector or monitor to the USB Server, why is it not working? Complicated USB devices like USB display projectors and monitors, which require software and driver installation may not function correctly with the USB server. Can I connect my USB T1000 Terminator Robot and hoping to control it using software installed on my computer? We do not know, complicated devices may or may not work with the USB Server. We even worry that your T1000 may take control of your computer through the connection rather than letting you control it. The only 1Gbit/s USB server I could find worldwide. Delivered in just 3 days, congrats to ChinaVision and thanks!